On Tuesday January 28, 2013 Luistxo Fernadez (@luistxo), from Code Syntax, a Basque web development company, introduced Niagarank to our Technology Immersion class. 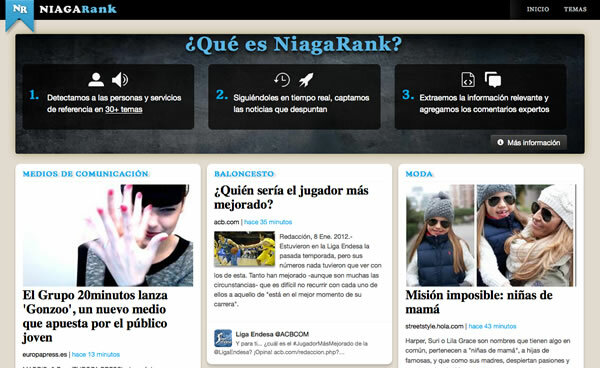 Niagarank is a new tool, which was launched on January 7, 2013. The way it works is really interesting and useful to many of us, who love to be informed and not overwhelmed by useless information. Niagarank follows thousand of twitter users. Then, it ranks the users and the news that those users are twitting the most. Afterwards, the platform filters all the information and it publishes the most interesting news by selecting the top forty stories and posting them on each its different forty channels. CHECK IT OUT AND START USING IT!!! Social networks have become an indispensable tool for many journalists all over the world when reporting breaking news. Now, being connected and doing journalism using social media such as twitter and facebook is not anymore an option, it is a complementary reportingtool. Social media has become in a powerful and complementary tool for journalists due to the high level of engagement of its users. Besides, there is a huge user’s presence on the networks that can definitively add value to the news stories. This being said, we can see how breaking news are not anymore a commodity because of the social networks. Lets take a look at two cases that support this statement; these are the case of a Tribune Reporter while working on the Virginia Tech University shooting in 2007, and a CBS Reporter, while covering the shooting of Tucson in 2010. Matt Larson from Tampa Tribune, on April 16, 2007, when a gunman killed 32 people and wounded 25 others at Virginia Tech University, started using social networks as a tool for his job. He stated “I use social media mostly for three purposes,” he says. “First, to reach family and friends of victims and suspects, and to get photos and gather information. Second, I use Tweet Deck and other social media to gather intelligence and keep on top of trends and subjects. Third, I use social media to build branding, get my name where it needs to be and build sources.” He pointed out that while working on this breaking news story, social media played a stellar role on his stories. Another case that showcase this trend is the Tucson’s shooting of 2010. Paul LaRosa of CBS expressed the important role that social media, specifically twitter, played on his job when this event happened. He says he was monitoring Twitter on Jan. 8, 2010, after the shooting of Congresswoman Gabrielle Giffords and 20 others in Tucson by Jared Loughner. He spotted several tweets from a woman claiming to be a high school classmate of Loughner. He alerted the network’s news desk, and CBS interviewed the woman after confirming her connection. She provided good breaking-news details on the accused killer’s nature and background. Mahaney says every news operation should have an ear and eye on Twitter during important breaking-news events. “Get TweetDeck up on your computer screen,” he says. “Learn how to search it, how to listen, how to follow a breaking story. Develop social media relationships with police leaders, political leaders. Learn how to use the tools it gives you—how to do a geographical search of everyone tweeting within a five-mile radius, for example…To me, those are skills that everyone in our newsrooms ought to have. And the second step is, now that I have learned it, what do I do with it?” It is definitively proved that social media is changing the way journalists work all over the world. Breaking news isnot anymore a commodity in the market.